The zipped files provided here are ASCII Grid format files, which can be used in most GIS software. Each zip file contains pollutant-specific gridded emissions for year 2016 by CORINAIR SNAP sectors. Note that some pollutants might not contain emission maps on some sectors (not all sectors generate emissions). 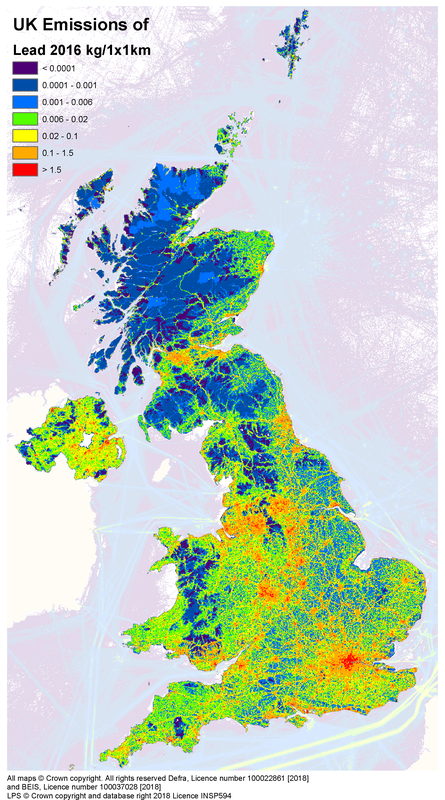 All data on this site is derived from mapping data provided by one of the UK national mapping agencies and other organisations. Downloads for Great Britain are made available and licenced under the Open Government Licence . © Crown copyright and database rights 2018 licenced under BEIS's Public Sector Mapping Agreement with Ordnance Survey (licence No. 100037028) and Defra's Public Sector Mapping Agreement with Ordnance Survey (licence No. 100022861). For Northern Ireland only: This is Crown Copyright and reproduced with the permission of Land & Property Services under delegated authority from the Controller of Her Majesty’s Stationary Office © Crown Copyright and database right 2018 INSP594.